Paris Accord good, Trump bad? The coverage of President Trump’s refusal to re-commit the USA to the Kyoto Protocol is conspicuous in its dearth of analysis of the details of the agreement itself. Perhaps such analysis doesn’t fit the “narrative” we are being offered? It is possible the media editors believe the public aren’t suitably skilled or qualified to comprehend the details. If so, perhaps they might remind themselves that one function of professional news journalism is to act as the intermediary between complex ideas and an uninformed audience. As with all enquiries into objective truth, there is no substitute for doing your own research. Accepting the first position offered as authoritive without question is both dangerous and illogical. What is the aim of the Paris Accord? How does the Paris Accord intend to achieve this? Well, the 2nd bullet point above is the main method, which suggests it’s an action not an outcome. It also suggests that human emissions are the majority factor in the forecasted increases in temperature. We won’t investigate that assumption here today but let it go unchallenged for the sake of our “whither the Paris Accord?” subject. Specifically, the Paris Accord sought a commitment from all signatory counties to reduce their emissions. In the case of the USA, this would require a reduction of around 27% from the 2005 level by 2025 (i.e. a quarter reduction in emissions in less than 8 years). The USA would also be required to transfer around $3bn per year to developing countries to aid their emissions reduction programmes. These commitments would be non-binding and there would be no consequences for failing to achieve them. How much would it have cost the USA? $3bn in a straight transfer to developing countries and a (assuming a reduction of 25%), a further $4bn reduction in GDP. What guarantee was there that other major polluters would have held to their commitments? 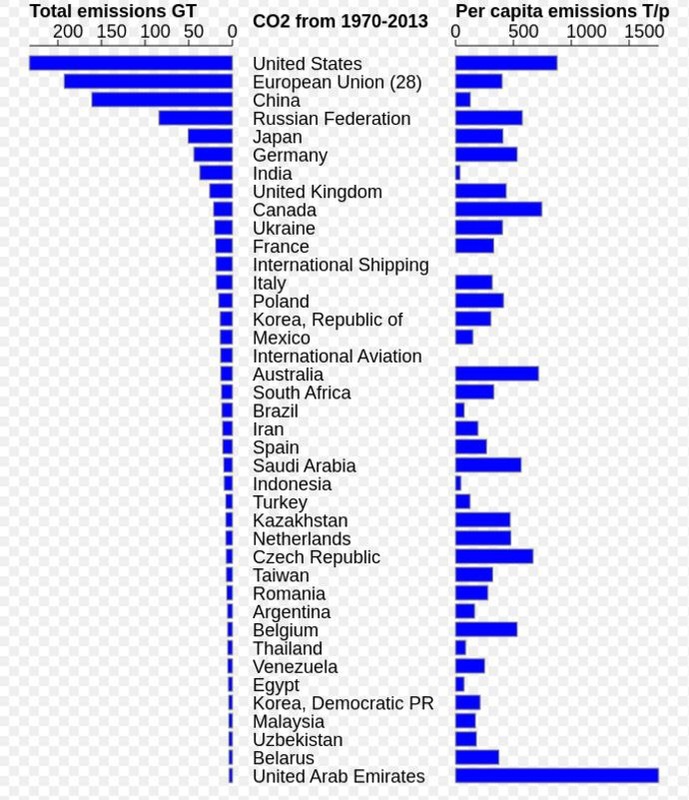 Specifically, what is the track record of the next two biggest polluters, China and India (ignore the confusing “EU” line on this Pareto as the EU countries are also shown individually and there is little evidence that the EU regulations will be adhered to by many of the countries)? Woeful. China can’t even bring herself to tell the truth about GDP. Was it a good deal for the USA? $7bn per year, almost half of which would have been redistributed via the UN to developing countries will little or no oversight or consequence to confirm that it arrived at the intended end point or outcome? No, it’s an awful deal for the USA but, more importantly, anyone who truly wants to reduce global emissions of greenhouse gases. It’s a great deal for anyone who wishes to redistribute global wealth, which is perhaps the more pertinent point. Donald Trump was elected by the American people for the American people. The deal on the table didn’t have their best interests at heart, even considering the place in the world as so-called global citizens. In fact, a recycling of $3bn into the economies of the 3rd world via their, largely undemocratic and often highly corrupt, governments would likely result in very little difference to the developing world’s emissions either. In addition, the effective hamstringing of one of the world’s most innovative countries is likely to reduce the rapid progression to more environmentally-friendly energy. Previous ArticleIs Universal Basic Income just Marxism by another name? Next ArticleIs there utility in viewing the government as a person? Paris accord is just an advertisement, a public relations exercise. These things are built to placate the fearsome or arouse fear, isn’t that what international policies are these days. It’s an incredibly large industry for a PR exercise. Go to the official website and get a feel for quite how much effort has been expended so far to agree the documents. One wonders how they stay motivated given that none of it is binding.